Citation: Eleutério T, Pereira MJ, Vasconcelos HC. Effect of extraction method on physicochemical characteristics of kahili ginger (Hedychium gardnerianum) fibres. Mater Sci Nanotechnol. 2018;2(1):1-4. Hedychium gardnerianum, Natural fibres, Enzymatic retting, Chemical retting, Mechanical extraction. Hedychium gardnerianum (kahili ginger) is a perennial herbaceous plant from the Zingiberaceae family and native of the eastern parts of Himalayas (Nepal, Bhutan, India) . This species become invasive in several archipelagos of volcanic origin where it was introduced, as the Azores, New Zealand, Hawaii or the Reunion Island and belongs to the list of the 100 worst invasive alien species in the world . The invasive behaviour of kahili ginger can be explained by the attraction and tolerance of the human being to the beauty of its flowers, the mild climates, the absence of natural enemies, the frequent rains and landslides breaking out and spreading the plant rhizomes of this shade-tolerant and self-compatible plant, allowing the development of dense monospecific rhizomatous mats (in both disturbed and undisturbed habitats) producing seeds in abundance, which are subsequently dispersed by birds typically abundant and diversified on Oceanic islands [3-7]. Kahili ginger was introduced as an ornamental plant in São Miguel Island in the 19th century  being one of the most serious invasive species at the Azores, only absent in the coastal zones . In the Azores, this species has been used as ruminant feeding in winter times because of grass shortage  and fresh cheese packaging. Recent research on this species is directed to the use of this species in ruminant feeding  and on the search of molecules with biological activity in their essential oils . Moreover, preliminary studies on structural and thermal characterization of H. gardnerianum fibres concluded that these fibres possess high cellulose content . In order to improve environmental health, researchers are making efforts to replace synthetic fibres by natural fibres with similar properties, emphasizing the several properties of natural fibres as renewability, biodegradability or their low density . The Kahili ginger Azorean fibres represent a potential raw material to industries, thus turning possible to reduce the landscape waste management cost . In general, the properties of fibres are influenced by several factors, namely, the soil and climate environment, the plant development stage at the harvest , the source of the fibres (stem, roots or leaves) and the extraction method. Fibres extracted from mature plants are difficult to extract since mature fibres adhere more to the secondary cell wall . Natural fibres can be extracted using mechanical, enzymatic or chemical methods. The mechanical extraction method generally uses a decorticator to separate the fibres , but with this method, fibres get slightly damaged . In the enzymatic methods, generally known as retting, micro-organisms degrade long and complex molecules like pectins that occur as structural polysaccharides in the cell walls . Finally, the chemical method generally includes maceration with an alkali solution obtaining clean and well-defined fibres. In this study we used kahili ginger plants from the Azores to investigate the influence of the three extraction methods (mechanical, chemical and enzymatic) on the following physicochemical characteristics of fibres: water absorption and moisture content, ash content, extractable content, and lignin, cellulose and hemicellulose contents. Fifteen kahili ginger plants with similar size and at the vegetative stage were harvested at July 26th on a population located at Fajã de Cima (São Miguel Island). Leafs and rhizomes were removed and each stem was separated into three samples to each extraction method. In the mechanical extraction, kahili ginger stems samples were crushed with a mechanical hammer, then carded with steel combs and finally dried at 25°C for 3 days. In the enzymatic, stem samples were soaked for 2 min in a 50 mmol of EDTA (Sigma Aldrich) + 0.05% of Viscozyme L (Sigma Aldrich) solution adjusted to pH 5.0 with NaOH (Sigma Aldrich), then drained for 30 s and finally incubated at 40°C for 24 h . Lastly, in the chemical extraction stem samples were macerated in a 0.5 N NaOH solution (Vfibres/VNaOH solution=10:1) at room temperature for 24 h, then the solution was heated at 80°C for 30 min. After heating, the solution and all components extracted from the stem were drained, and the fibres were disaggregated. Then, the fibres were washed, initially with warm water and then with cold water. Finally, to remove NaOH residues, the fibres were washed for 30 s in acetic acid (99%, Sigma Aldrich) and dried at 25°C for 3 days. The water absorption (WA) was calculated by means of Eq. 1 Ten fibre bundles were weighed as Mi before being immersed in fresh water at room temperature, for 24 h. After immersion, the fibres were weighed and termed as Mf. For moisture content (MC) evaluation, ten fibres were placed for 24 h in an oven (Marca ®) at 20ºC and 70% relative humidity, before weighing. Then the weight of fibres was measured as Mi. In the following, fibres were heated again for 24 h but at 100ºC and then weighed as Mf. The MC of fibre was calculated using Eq. 2. The ash content (AC) was obtained after fibre calcination at 525°C, for 2 h, according to the TAPPI Standard T 211 om-93 . Before calcination, the weight of ten fibres was measured as Mi. After 2 h in the oven, the fibres were weighed again as Mash. The ash content was calculated by Eq. 3. The extractable content (EC) was done according to the TAPPI Standard T 204 om-88 . The weight of the ten fibre bundles was measured as Mi and placed in a Soxhlet apparatus with acetone (Sigma Aldrich). The extraction took place for 4 h period; then, the acetone was evaporated on a rotary evaporator, and finally, the extracts were dried at 110°C for 12 h in the oven and weighed as Mexc. The EC value was calculated by means of Equation Eq. 4. The lignin content (LC) was determined by the Klason method described in the standard TAPPI T 222 om-88 , which quantifies the lignin as a solid residue. The cellulose content (CC) was calculated applying the method described by Browning , were cellulose is obtained by refluxing the sample three times for 1 h in VHNO3: VEtOH=1:4. The weight of the ten fibre bundles was measured as Mi before reflux. At the end of each hour, the supernatant was removed by decantation and the volume of the solution adjusted. The insoluble residue obtained after 3 h was weighed as Mcc. CC was determined by Eq. 5. Finally, the hemicellulose content (HCC) was calculated applying the Eq. 6. All the extractions performed, as expected, long, welldefined fibres. However, in each extraction, the fibres had distinct colours, mechanically extracted fibres had a whiter tone, enzymatic retted fibres had a brown tone and chemical extracted fibres had a yellow tone. The colour is one of the characteristics used to determine fibre quality alongside, fibre strength, cleanness, fineness, length, and percentage of cutting . This variance might be due to the different processes through which the fibres passed , also, a small amount of organic and inorganic substance’s present on natural fibres which are responsible, for color, odor and decay resistance and abrasive nature of natural fibres (Figure 1) . Figure 1. Hedychium gardnerianum extracted fibres. A – Mechanical Extraction; B – Enzymatic Retting; C – Chemical Extraction. Analysis of Table 1 shows that kahili ginger fibres contain cellulose, hemicellulose, lignin, which are chemical substances primarily found in plants raw materials . The high cellulose content in kahili ginger fibres explains the high water absorption since they have more free hydroxyl groups available on the surface of the fibres to bind water molecules . Moreover, the data reveals that the fibres physicochemical characteristics were not significantly changed by the extraction method used. Cellulose Content; HCC: Hemicellulose content. Mean values of weight (%) ± standard deviation. Within columns means separation at 5% level is indicated with different letters. Table 1. 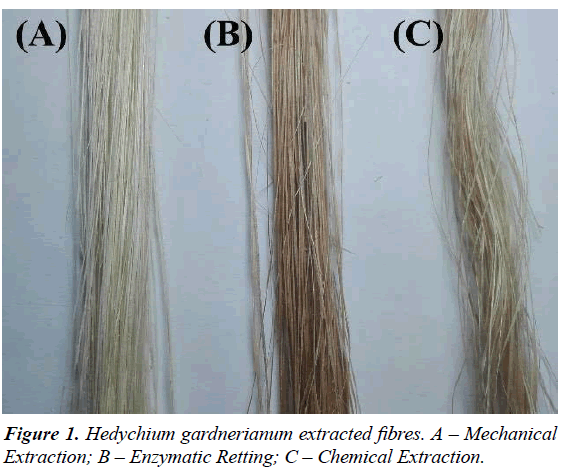 Physicochemical characterization of Hedychium gardnerianum fibres. The Table 2 [22-24] allows us to compare some physicochemical characteristics of kahili ginger fibres with other natural fibres. Kahili ginger fibres presented superior cellulose content and an inferior hemicellulose content when compared with flax, hemp, jute, kenaf and ramie fibres. Lignin content was similar to those of hemp, jute and kenaf. Also, the extractable content was comparable to the flax, hemp and kenaf. Lastly, due to the lack of information regarding the samples and analytical procedures for some species shown in the Table 2, it is not possible to provide an analytical test between Kahili ginger fibres and fibres of other species. Thus, the values in Table 2 should only be regarded as guidelines. CC: Cellulose Content; HCC: Hemicellulose Content; LC: Lignin Content; EC: Extractable Content. Values in % . Table 2. Physicochemical characterization of fibres from different species.epoxy. Since all extraction methods had similar results on fibres physicochemical characteristics, the suitability of the methods will depend on the further application of the fibres. If the fibres are to be used for their tensile strength, then we should not use the mechanical extraction to avoid damages on fibres surface. Since kahili ginger fibres have a cellulose content higher than other stem fibres we expect that these fibres have higher tensile strength than other stem fibres . Furthermore, because of the augmented number of possible reaction sites (-OH groups) at fibre surface, they might have potential applications in composites or as functional textiles. Nevertheless, additional characterization is needed to better understand the full potential of these fibres. Mitra JN. Flowering plants of Eastern India. Calcutta: The World Press Private, Ltd.1958. Global Invasive Species Database. 100 of the world's worst invasive alien species. Downloaded from http://www.iucngisd.org/100_worst.php on 14-04-2017. 2017. Csurhes S, Hannan-Jones M. Invasive plant risk assessment: Kahili ginger (Hedychium gardnerianum), white ginger (Hedychium coronarium), yellow ginger (Hedychium flavescens). Department of Agriculture and Fisheries, Biosecurity, Queensland. 2008. CABI. Crop Protection Compendium. Commonwealth Agricultural Bureau International (CABI). Wallingford, UK. 2008:21. Rambuda TD, Johnson SD. Breeding systems of invasive alien plants in South Africa: does Baker's rule apply? Diversity and Distributions. 2004:10:409-16. Cordeiro N, Silva L. Seed production and vegetive growth of Hedychium gardnerianum Ker-Garler (Zingiberaceae) in São Miguel Island (Azores) Arquipelago. LifeMarine Sci. 2003:20A;31-6. Schaefer H. Flora of the Azores, a field guide, second enlarged edition. Weikersheim: Margraf Publishers/Backhus Publishers. 2005. Nunes H, Falé PL, Duarte MF, et al. Pittosporum undulatum and Hedychium gardnerianum: nutritive value and secondary metabolites on cattle reproductive perfomances. Int J Pure Appl Sci Technol. 2014:22(2);1-9. Moselhy M, Nunes P, Borba AE. Effect of replacement of ordinary ruminant feed with Hedychium gardnerianum or Pittosporum undulatum on in vitro rumen fermentation characteristics. Int J Advan Res. 2014:2(10);91-104. Arruda M, Viana H, Rainha N, et al. Anti-acetylcholinesterase and antioxidant activity of essential oils from Hedychium gardnerianum Sheppard ex Ker-Gawl. Molecules. 2012:17(3); 3082-92. Eleutério T, Silva Pinto A, Pereira MJ, et al. Preliminary Structural and Thermal Characterization of Conteira's (Hedychium gardnerianum) Fibers for Further Functionalization with Silica Colloidal Nanoparticles. Procedia Engineering. 2017:200;162-9. Ashik KP, Sharma RS. A review on mechanical properties of Natural Fiber Re-inforced Hybrid Polymer Composites. Journal of Minerals and Materials Characterization and Engineering. 2015:3;420-26. Ochi S. Mechanical properties of kenaf fibers and kenaf/PLA composites. Mech Mater. 2008:40;446-52. Munder F, Furll C, Hempel H. Processing of bast fiber plants for industrial application. In: A.K. Mohanty, M. Misra, L.T. Drzal, (Eds.). Natural fibers, biopolymers, and biocomposites.2005:109–40. Sampaio S, Bishop D, Shen J. Physical and chemical properties of flax fibres from stand-retted crops desiccated at different stages of maturity. Industrial Crops and Products. 2005:21;275-84. Yusof Y, Adam A. (2015). Review on PALF Extraction Machines for Natural Fibers. Advanced Materials Research Vols. 2015:781-784;2699-703. Tahir PM, Ahmed AB, SaifulAzry SOA.et al. (2011). Retting Process of some bast plant fibres and its effect on fibre quality: A Review. BioResources. 2011;6(4);5260-81. Akin DE, Foulk JA, Dodd RB,et al. Enzyme-retting of flax and characterization of processed fibers. Journal of Biotechnology. 2001:89;193-203. Prozil SO, Evtuguin DV, Lopes LPC. Chemical composition of grape stalks of Vitis vinifera L. from red grape pomaces. Industrial Crops and Products. 2012:35(1);178-184. Faruk O, Bledzki AK, Fink HP,et al. Biocomposites reinforced with natural fibers 2000-2010. Progress in Polymer Science. Vol. 37. 2012:11;1552-96. Pickering KL, Aruan Efendy MG, Le TM. A review of recent developments in natural fibre composites and their mechanical performance. Composites Part A: Applied Science and Manufacturing. 2006:83 ;98–112. Célino A, Fréour S, Jacquemin F, et al. The hygroscopic behaviour of plant fibers a review. Frontiers in Chemistry.2014:1(43);1-12. Zeronian SH, Kawabata H. Alger KW. Factors affecting the tensile properties of nonmercerized and mercerized cotton fibres: Textile Research Journal. 1990:60;179-83.